Are your prayers filled with passion? How can we weak human beings express fervency when we approach our Heavenly Father? 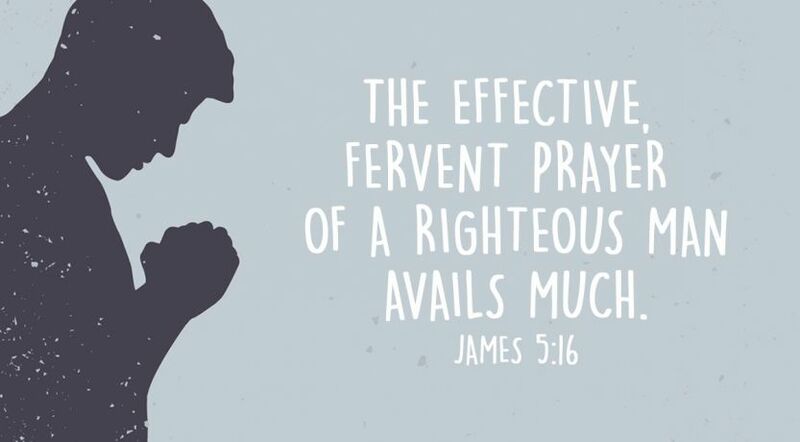 In James 5:16 we read, “The effective, fervent prayer of a righteous man avails much.” What does it mean to be fervent in prayer? To illustrate the impact of effective, fervent prayer, James refers to what God, through the prophet Elijah, did to get the attention of Ahab, an evil king of Israel. Ahab tried to strengthen his realm by negotiating trade treaties with other nations. However, he encouraged the worship of the pagan god Baal, even erecting a temple to his honor in Samaria. Therefore, Elijah warned Ahab that a severe drought was coming and that it would last a long time. James says, “Elijah … prayed earnestly that it would not rain; and it did not rain on the land for three years and six months” (James 5:17). God heard and honored that earnest prayer. After 3½ years without rain, Ahab and Elijah met face-to-face, and a contest was arranged to determine whether Baal or God should be worshipped. Ahab gathered 450 prophets of Baal on Mount Carmel to erect an altar and to prepare their sacrifice. They began to plead with their god to accept their offering by consuming it with fire. Hour after hour elapsed while Elijah taunted and ridiculed them. Their sacrifice remained as it was. “LORD God of Abraham, Isaac, and Israel, let it be known this day that You are God in Israel and I am Your servant, and that I have done all these things at Your word. Hear me, O LORD, hear me, that this people may know that You are the LORD God, and that You have turned their hearts back to You again” (1 Kings 18:36-37). Only 63 English words are used to record Elijah’s prayer. When he concluded, every single thing connected to the sacrifice he offered to God was utterly consumed by fire! The astonished observers declared the omnipotence of the one God, and the 450 prophets of Baal were killed. Then Elijah prayed again, this time for rain (James 5:18). “Elijah went up to the top of Carmel; then he bowed down on the ground, and put his face between his knees, and said to his servant, ‘Go up now, look toward the sea’” (1 Kings 18:42-43). The Bible does not give us the words of this prayer, but it does tell us that seven times Elijah sent his servant to look! Elijah’s urgency and perseverance are clear; God answered and the drought ended. Elijah’s prayers were fervent and effective. Was Elijah an exceptional man? James describes him as “a man with a nature like ours” (James 5:17). He was certainly used by God in exceptional ways, but we share the same physical and mental makeup. What does it mean to be fervent? The phrase “effective, fervent” in verse 16 is translated from a Greek word that indicates there is some work, some effort, associated with this endeavor. The Greek word is energeo, and the English word energy is derived from it. Therefore, fervency isn’t something that normally comes easily. There must be an active component of real zeal or commitment―mental focus. Fervent is a word not ordinarily used in our conversations today. As a matter of fact, the term is scarcely used in the Bible. In the book of Acts we meet a man named Apollos who traveled about the countryside teaching and expounding the Scriptures. Among his characteristics was the fact that he was “fervent in spirit” (Acts 18:24-25). The word zealous often comes to mind when we think of being fervent. Some of the newer versions of the New Testament describe Apollos as being very enthusiastic when he spoke. In other words, he became excited. The truth he spoke moved him. As Paul concludes his letter to the church in Colosse, he mentions that Epaphras was “always laboring fervently [Greek agonizomai, meaning ‘to contend or struggle’ (Online Bible Greek Lexicon)] for you in prayers” (Colossians 4:12-14). Epaphras was in prison in Rome with Paul (see Philemon 1:23) and was always praying for other people. He prayed as though he was in literal battle for them as they fought for the Kingdom of God. Many preschool-aged children have been introduced to prayer by simple poems either thanking God for the food they’re going to eat or by asking Him for a good night’s sleep. We probably wouldn’t describe those prayers as fervent. When we open the pages of the Bible, we can read that Elijah, and others, prayed to God and obtained astounding results. When we open the pages of the Bible, we can read that Elijah, and others, prayed to God and obtained astounding results. We might think we could never accomplish anything like that! But bear in mind these men and women were simply human beings just as we are. They followed dreams, battled forces, ate food and drank liquids as everyone does. There are recorded prayers of prophets and judges, of men and women, of young and old. Circumstances varied, and there are prayers of joy and of sorrow. The subjects differ, but most of these prayers were given with fervency—with some degree of conviction, focus and zeal. A quick look at the outcome of just a few of the earnest prayers recorded in the Bible reveals that personal requests were honored (1 Samuel 1:27-28), the Holy Spirit was given (Acts 8:14-17), the dead were raised to life (Acts 9:39-41), people were healed (Genesis 20:17–21:1; Acts 28:8) and personal losses were restored (Job 42:10). When we pray, we should meditate on these instances as well as so many others recorded for our encouragement and direction. God doesn’t ask for dramatics. Elijah didn’t mimic the priests of Baal as he prayed on Mount Carmel; he simply focused on the one true God. God wants our prayers to be fervent, to be heartfelt and filled with earnest zeal. When our prayers are not mundane, amazing things can happen.